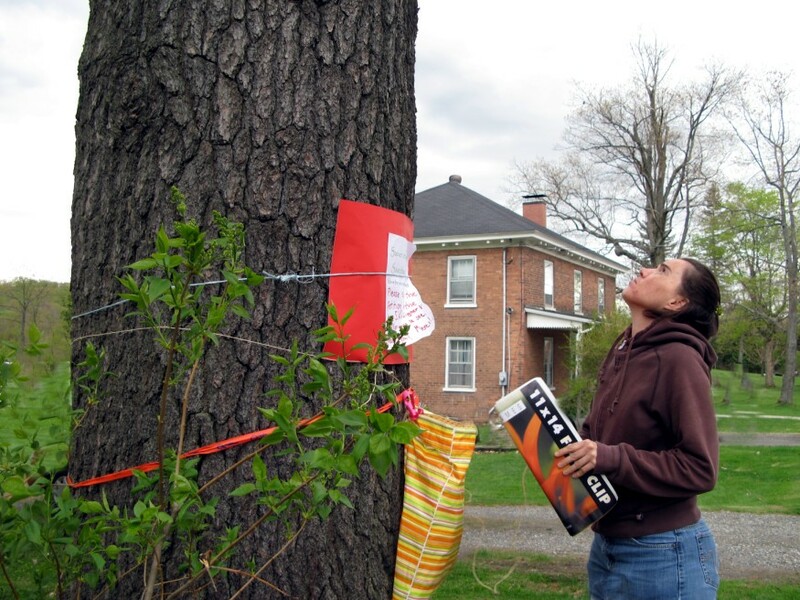 Destination Knowlton >: So Our Trees Are Becoming A Nuisance? A beautiful elderly tree on St. Paul Street has been selected to be cut down and residents are asking if this is part of what seems to be a growing trend where development and individuality seems to take priority over our collective environment. 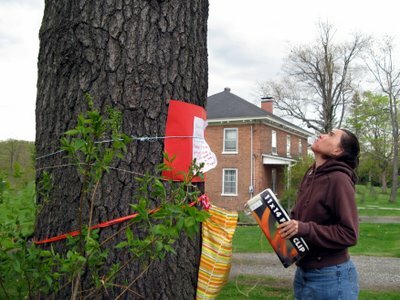 Residents on the lovely and historical street in Knowlton were chagrined to see a Hydro-Quebec marker on the huge and healthy tree near the historic St. Paul Anglican Church which meant the old-growth tree may soon be cut down, unless, of course, the residents who are mounting a petition can convince all sides involved to reconsider! Concerned citizens, including children who live within the vicinity of the tree, immediately placed a hand-drawn poster on the tree and tied ribbons and even placed a petition for residents to sign on the trunk of the tree that has stood for generations near the historical church on St. Paul street across from the Historical Museum of Brome County and across from the Brome Lake City Hall. 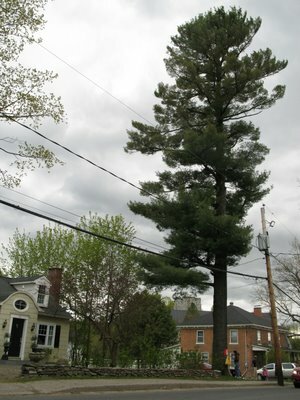 That such a healthy and prominent tree could even be considered for removal has shocked and appalled residents! 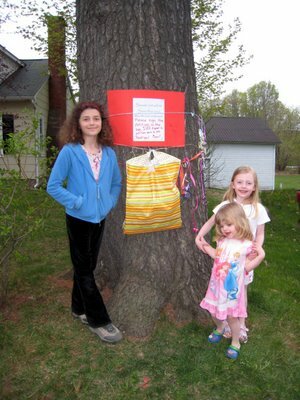 Neighborhood children living near the tree decided that something had to be done and armed with only ribbons and crayons, and maybe some parental support, decided to start a petition and allow passers-by to sign their names and leave it in a colored sack hanging on the tree. 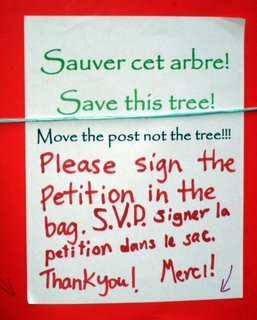 When this intrepid reporter stopped to check the bag it seemed that many people had signed the petition to save the tree! People under the tree were wondering why Hydro-Quebec would want to cut down the tree which was over one-hundred years old and who even asked them to perform such an abomination! Granted if a tree is hazardous to human life-and-limb or threatens to disrupt electricity transmissions then something must be done but doesn’t it make more sense to try and accommodate the tree by maybe moving a telephone pole instead; and if that $2000 price tag to move a phone pole is too rich for anyone then you have to ask where the priorities are in our world? 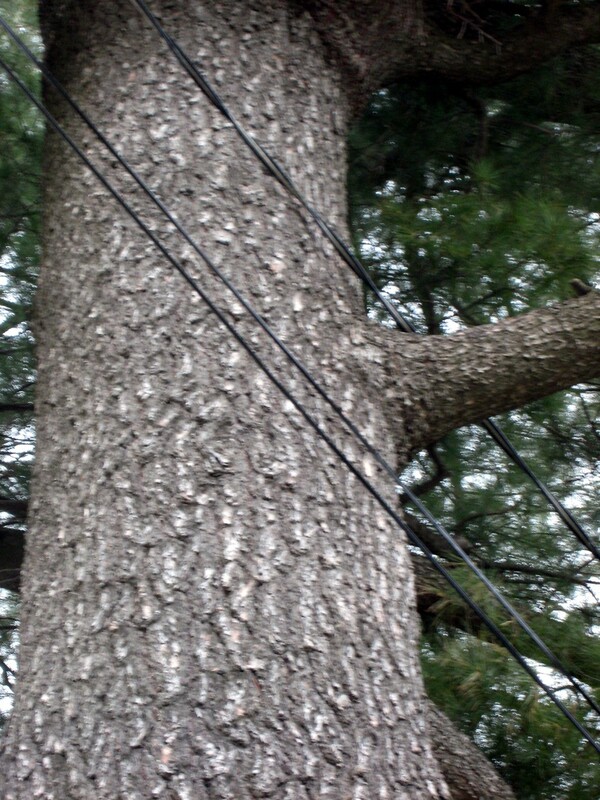 Why not place a simple insulated saddle to keep the wire safely away from the tree? Hydro-Quebec was apparently contacted by a resident and indeed they had marked the tree for destruction based on this request of a resident. It has yet to be ascertained if a local resident was concerned for the neighborhood safety or if there were insurance issues based on the proximity of the tree to a neighboring home on St. Paul Street. 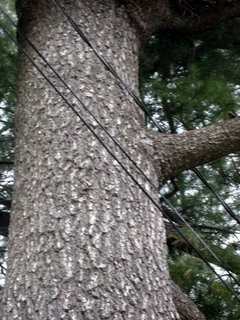 As far as Hydro-Quebec charging in with chainsaws blazing due to the tree being close to the power lines, which do admittedly come within the proximity of the White Pine, why does this Corporation have the mandate to go in and rip out trees? Didn’t their engineers maybe contemplate the surrounding trees when they were digging holes for their poles? This tree is over one-hundred years old and any rightly-oriented person would wonder who was there first….the tree or the person who asked for the removal of the tree? 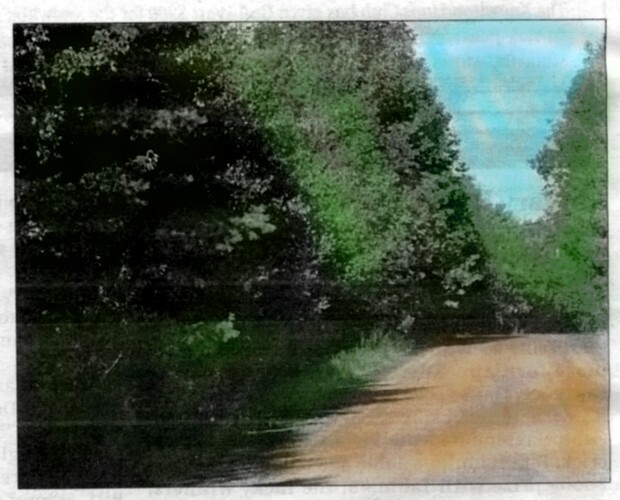 Anyone doing a monthly survey of traffic on St. Paul Street shows that, as is typical in Brome Lake and Knowlton, there are often two types of residents: those who live here permanently and want to raise their children in a quiet and natural setting that is both healthy and environmentally progressive, and those who live far away and maintain a weekend residence who think inside a bubble only inches larger than their own property. Some people pop in and out of the village into their second or third homes that they bought in Brome Lake and feel that their domain should be their little pink toy that they can do what they want with so it looks like something from the pages of a Martha Stewart Home Sense magazine! Didn’t we see our former Prime Minister, Paul Martin, kill some lovely trees and blatantly disregard environmental laws in order to have a private golf course on his property only to have a little tap on his wrist? Didn’t we see another private resident get fined by the Town for cutting down trees without a permit? 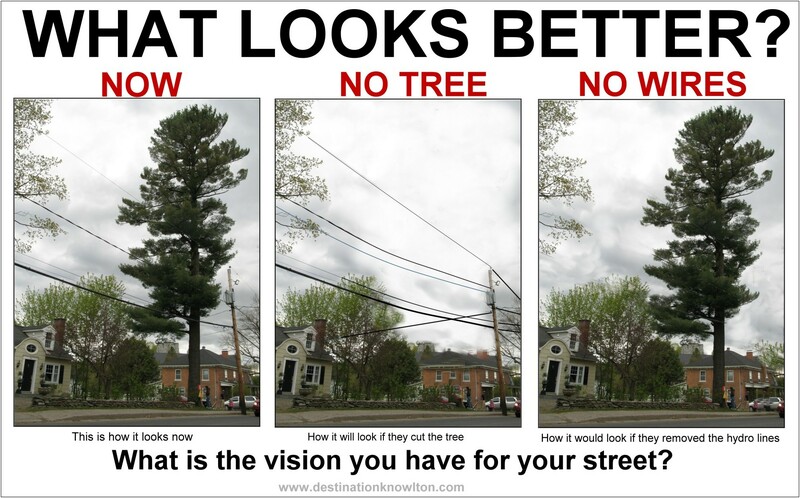 Aren’t we seeing massive destruction of trees in Dunham because Hydro-Quebec wants to put in hydro lines? Aren’t we seeing Knowlton going onside with the Main Street (Rue Principals) program which mentions hiding the hydro lines in order to beautify the Town? People in Brome are seeing a few inconsistencies and arbitrary contradictions so it is no wonder that people are calling the Town to ask what is happening! Take a look at this picture! Admittedly, I am not a German Windmill Engineer so Hydro-Quebec will likely reject my proposal to keep their poorly placed line from touching the tree but I won't be deterred: A small brace on the tree with glass insulators would keep the line spaced securely away from the tree...but it seems that the solution is just too simple for them to grasp! Chainsaws and axes have worked in the past so why change policy? 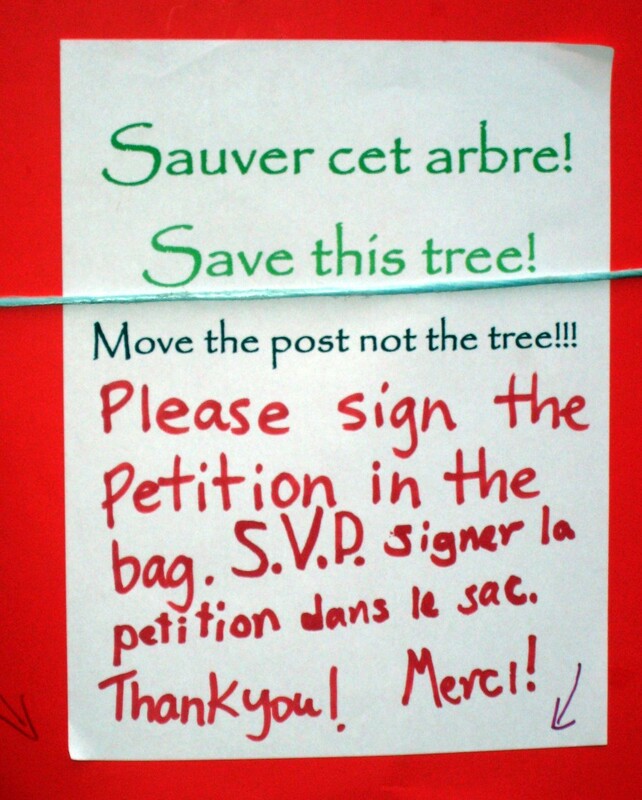 Reportedly, a resident who phoned the Town of Brome Lake regarding the tree on St. Paul Street was told that the Town couldn't really object if a resident within their legal rights asked for the tree to be cut down by Hydro-Quebec; calls to Hydro-Quebec seemed to give the response that they were waiting for word from the Town of Brome Lake. Isn’t it convenient when both sides of suggest that it’s up to the other to make the call! At least the children are brave enough to take a stand and do something instead of passing the buck! Some of the more jaded amongst us are saying that the tree will come down and no ribbon and petition campaign will make a bit of difference. Some of the more jaded of the jaded say this tree is coming down for no other reason that someone in the vicinity of the tree objects to the pine needles tumbling onto their property garden. Goodness! Imaginations can run amuck! It would be disturbing to think that anyone in this day of global warming would be able to find a justifiable reason to chop down a mature and healthy tree. The trees and hills and lakes around us define who we are and people who choose to live here should accept that our natural wilderness is an integral part of our heritage and cannot be removed just so a property owner can live in homes reminiscent of Canadian Home and Garden with perfectly manicured gardens and optimal views of the hills and lakes. Maybe the tree is a threat to fall during a windstorm? Why not do a simple core sample and see if the tree is healthy? Some experts state that such a tree has a huge root expanse and there is little if any risk the wind could knock it over being in the solid soil it's in. There's more risk of a Quebec highway overpass collapsing on someone than there is that this healthy tree would ever come down! This sign was placed by the kids on the White Pine tree. Hmmm...they even made a bilingual sign which is more than many folks do when they make signs in the Town of Brome Lake for their for sale signs or those soon to be banned garage sale signs! Some people point out that The Town of Brome Lake always seems to throw their hands into the air whenever a serious issue comes up and says they can’t do a thing about because it’s not their decision…when taxes go up for us they say it’s the evaluators fault…when a stop sign can’t get put in…they say it’s the Québec government that has to do it…when we are fed up with having no good police force they say they have no choice…trees being cut…can’t do a thing…lake pollution…can’t enforce any laws…goodness gracious what the heck are people paying taxes for? How can a healthy tree that is older of any resident in this town be chopped down when there must be alternatives available! My goodness it is sad to see the children of St. Paul Street so upset! Many of us who grew up in rural Canada had a particular tree that was where we had a tree-fort or a tire-swing or stole a first kiss sitting under the trunk. We used to marvel at the bark of the tree and marvel at the birds who danced and chirped in the boughs above our heads; the ants and spiders and squirrels made us, as children, feel that a tree was worth protecting as it was the catalyst for so many species. So many creatures coming together in the global simplicity of a tree! This picture shows a resident of Knowlton signing the petition and looking up...way up...to the top of the magnificent pine. Of course everyone has a right to own many houses around the world and many cars but when the children of Brome Lake are tying ribbons around a tree and have tears in their eyes it is time to see the leaders take a stand instead of saying that they have no control over what goes on. It seems that in other municipalities where Rues Principals has worked they are often suggesting that burying hydro-lines is one way to improve the look and feel of a town so it seems ludicrous that Hydro-Quebec is removing trees at will and the Town who supports Rue Principals philosophies would just say “Oh Well”! Last year another favorite tree for many residents was unceremoniously cut-down and then the Town, after having publicly announced their new directions in environmental progress days before, literally destroyed a natural filtering system that feeds the lake after a resident complained that the helpful plants were an eyesore! OUCH! In Dunham the tragedy of the trees being removed has made the front pages of the local newspapers! To see the before and after pictures is a heart breaker! Hydro-Quebec has spent millions on their marketing, including that lame commercial that shows some hydro electric dam a la James Bay project powering a Tokio Hotel band wannabe guitar yet they refuse the windmill projects submitted by the local Bromont Windmill company in favor of some German group…great…a Quebec company tried to help solve the energy crises and the Liberal Government and Hydro-Quebec say no causing massive fiscal loss for the local companies in Bromont. Some tinfoil-capped residents say its proof that the whole system is run by a Teamster-esque gang working in complicity! Near Dunham the hard work of planting trees by long-time residents had created a magical thick, lush clustering of vibrant living, breathing trees...a natural habitat for creatures big and small! 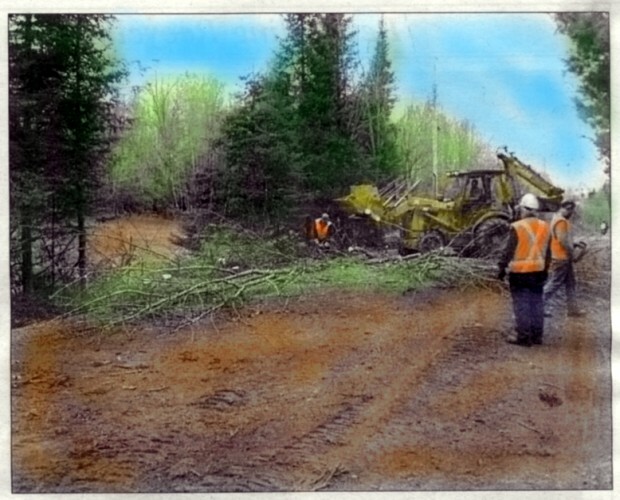 The same road seen during the Hydro-Quebec clearing frenzy eradicated years of growth within moments to make way for power lines. With every destructive punch the planet gets beat down further into illness in the name of profits, progress and greed. Many feel that such disregard for such natural and historical structures in Brome Lake and across is proof that the entire “Save Our Lake and Join Kyoto because the Environment is our Priority” PR movement by our Canadian and Quebec Government leaders is nothing more than “Bunky duck doo-doo”!. Who knows what this German firm did to deserve the contract…maybe they employ people from Quebec? Not likely! While towns like Knowlton suffer due to some cosmetic ugliness caused by Hydro-Québec power lines and sub-stations, Hydro-Québec continues to refuse green windmill projects in our area and cuts down more and more and more trees! While business owners in Brome Lake work with Rue Principals to beautify the town, one of the obvious causes of ugliness throughout the village of Knowlton is the strings of wires and crooked creosote soaked poles spoiling the skyline holding drooping electric lines emitting electro-magnetic pollution. Hydro-Quebec continues to clear corridors of green space to make way for transmission lines to the USA…isn’t something similar happening in Alberta where the tar sands is being called an environmental catastrophe! Recently close to 1000 ducks perished while landing in a polluted waste water basin in Alberta. Some people see the profit-hungry government agency of Hydro-Quebec is willing to raze acres of forests just to appease profit targets and corporate bonus payments! These trees were here before all of us and will likely outlive most of us despite our grandiose schemes and delusions of importance! I have often stepped outside my door to look into my tree to see the birds singing and not caring a whip about me…if that tree was gone then their would be no birds singing to not care a whip about me…that would be as sad as to think of one of our children seeing a glorious tree being sawed down because some bureaucracy couldn't find a better way to save a life. Many times I have returned to my hometown back in Western Canada and passed by the old house we used to live in and the strongest emotion I feel is when I see the empty spot near our house where that glorious tree used to stand where I played hide-and-seek as a boy. I feel so sad for the children who love that tree on St. Paul Street because if it gets cut down they will feel the same poignant loss that I do thinking about my lost tree.